Goodreads Summary: Jett is a girl disguised as a boy, living as a gambler in the old West as she searches for her long-lost brother. Honoria Gibbons is a smart, self-sufficient young woman who also happens to be a fabulous inventor. Both young women travel the prairie alone – until they are brought together by a zombie invasion! As Jett and Honoria investigate, they soon learn that these zombies aren’t rising from the dead of their own accord … but who would want an undead army? And why? This gunslinging, hair-raising, zombie western mashup is perfect for fans of Cowboys vs. Aliens and Pride & Prejudice & Zombies. Interested in a fun summer read that stands out from the sea of paranormal and dystopia books out there right now? 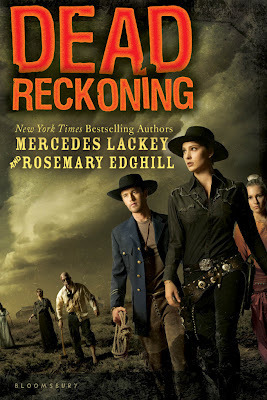 If you are then Dead Reckoning, a steampunk western with zombies, may just be the book for you. This book is original and entertaining, just what I needed to kick off my summer! Dead Reckoning is set in a western town where Jett, our feisty gunslinger who dresses as a boy so she can make her way around without too much trouble, has stopped find out if anyone knows anything about her lost brother. Jett’s visit is short lived as the town is attacked by zombies and Jett barely escapes with her life. The book’s setting is very well done and Honoria Gibbons’ steampunk inventions are very cool to read about. Jett and Gibbons are very opposite characters: Jett being very rational and a fighter and Gibbons being a dogged scientist who throws caution to the wind when it comes to her experiments. While Jett dresses like a boy, I liked the fact that she liked girly things but her circumstances dictates that she be disguised as a boy. The two girls strong personalities are balanced out by White Fox, the handsome Anglo boy that was raised by Native Americans. Dead Reckoning is a quick read with great characters, action and mystery. The ending is completely satisfying (no cliffhangers!) and while this could easily be a standalone novel, I’m hoping there will be a second book to expand on the storyline, especially the one involving Jett’s missing brother. Dead Reckoning is a clean read and is appropriate for both older and younger teens.